Whether you want a simple fresh look in your kitchen or you simply want to remodel it, kitchen tiles are some of the best design trends to consider. Tiles have a way of blending functionality, beauty and technology to make your kitchen an exciting place where you can catch up with family and friends, cook your favourite meals, or simply relax. Tile trends are amazing because they can be used in different places in the kitchen including the floor and on the walls. You only need to explore the best kitchen wall tiles ideas to achieve the desired effect in the room or add a little personality to your space. With a huge blend of designs, colours and tile sizes to choose from, you may feel overwhelmed on what will make your kitchen a truly exciting place. This article takes a look at some of the best kitchen tile ideas 2019 you can explore. Read on and learn of what 2019 has in store for your kitchen. Kitchen wall tiles design ideas come in handy. Whether you want to create a focal point of interest in the room or to make a bold statement, a tiled feature wall is what you need. It is not only solid, intimate and striking, but also a beautiful addition in the kitchen. A tiled feature wall in the kitchen draws attention, it creates a unique feeling, and it transforms the whole scheme in the room to add charm. It brings out the best in an already functional and beautiful space. Today, there are plenty of tiled feature wall options that will inspire you. It is however imperative that you consider the best modern kitchen tiles combination for the best look in your kitchen. Brick slips are a great option to use when having a kitchen feature wall. The texture is a big kitchen tile trend 2019. There are many tactile tiles with beautiful patterns. You may want to consider tiles with the best architectural shapes, designs and are futuristic. Angular and geometric tiles are known to create the best effect, especially to 3D surfaces. You can take a bold step and choose embossed patterns for a whole new look in your kitchen space. With advancements in technology, you can create a wood tiles effect in your kitchen. This trend was quite popular in 2018, and it is still a trend to go for in 2019. Digital printing offers new and more exciting developments for your kitchen. For something simple, you can settle for porcelain and ceramic tiles that mimic granite, stone and wood. Faux tiles, on the other hand, offer a more convincing and realistic texture. They are also highly versatile, comes in an array of beautiful textures, colour tones and beautiful options in the kitchen. Plain kitchen tiles laid in beautiful patterns. A more adventurous effect by blending dark tiles on your kitchen floors and taking them a little higher over the wall. Kitchen tiles design pictures and kitchen tiles design images are perfect for decorating your kitchen. They are available in beautiful colours, styles and designs. They are also easy to install. However, if you want to create a real and true impact in the kitchen, you need to consider large scale tiles. This is especially if your floor and wall plan is open. They make the space more open, calmer and they create a more luxurious look. Similarly, they create more space for your kitchen tiles pictures to enhance the overall look in the room. Over the recent past, there has been a rise in star prints or patterns in tile production. This is not only for the kitchen but also for different rooms in the house. Large scale star patterns make the kitchen to appear more spacious. Most importantly, there are kitchen tile design ideas that will add a sense of traditional and contemporary touch in your home. You should not limit yourself to the normal, flawless kitchen tile designs. You can always get more adventurous and make your space one of a kind. You will find an array of flawless, artisan-inspired tile designs, historical patterned tiles and the wonky handmade options. These tiles are exceptional and they inject character, interest and more aesthetic appeal to a contemporary kitchen. What’s more, you can explore unique kitchen tile schemes including tiles that are inspired by the natural world. Even though such kitchen tiles ideas the UK may come with unusual kitchen tile patterns shapes and designs, they add a layer of beauty and interest to kitchen tiled surfaces and walls. The art of mix and match is something that you cannot ignore, when it comes to kitchen tiles. There are many exciting patterns, shapes, designs and colours. Find a way of blending your favourite colours with textures, shapes and sizes. For example, you can mix and match white tiles, with hardwood floor tiles that feature staggered decoration. It makes your kitchen space more interesting and gives it a whole new look. You can also create an element of surprise with new style kitchen tiles. The kitchen is with no doubt a high traffic area. You can make your kitchen more beautiful, stylish and bespoke. Kitchen tiles trends 2019 are an excellent way to create the desired look in your kitchen space. Play with unique, cool and exciting patterns, texture and colour. The element of surprise will create a wow factor in the room. If you are not sure how to blend textures, designs and colours, you can always consult a professional interior décor expert for more ideas. If you love white and black, why not take advantage of the colours or play with unique patterns to achieve a contemporary monochrome feel/look in your kitchen. Explore graphic design chasers and bold patterns that will blend in with kitchen tiles images. Most monochrome patterns will assume specific colours, for example, lots of greenery in the environment. For dark colour options and effect, you may want a colour scheme that will make your kitchen space more natural than it is. Dark coloured or black tiles are an excellent way to add more contrast to your kitchen. They look even more beautiful when you blend them with grey kitchen tiles ideas, and gold or brass like metallic. You can also create a modern farmhouse effect in your kitchen using the best limestone and travertine tiles. Use them on your floors and preferably, consider ivory wall tiles or muted cream colours. They set off a classic and contemporary cottage look in the space. The beauty of playing with such tiles and exciting colours is that they do not wear out after a short span of time. They age timelessly while maintaining the aesthetic appeal of the kitchen. Alternatively, you can use metro tiles for a timeless look in the kitchen. For many years now, the tiles have maintained their classic style. Today, they are available in amazing textures and you can explore those with a high gloss finish. 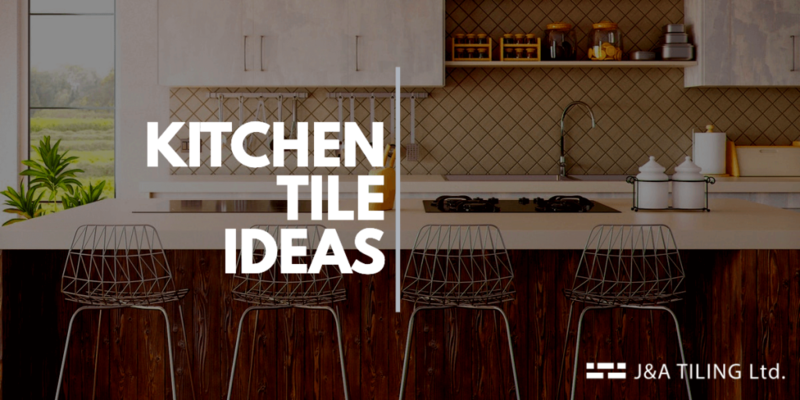 For a more unique look in your kitchen space, choose tile patterns and designs that will help you to create a blend of contemporary and traditional look in your space. You can also create a personalized effect in the kitchen and long lasting beauty. Stone is naturally a durable material. It has been widely used for ages on floors. In this case, shop around for stone textured tiles that will add more interest and exciting feature to your kitchen. Not only is stone excellent for high traffic rooms, but you can also use it to create a modern farmhouse kitchen and a beautiful space that will remain as a focal point in your space for so many years to come. For a more exciting look, you can use marble stone as it is uniquely beautiful. This is good if you have a small kitchen or you want to spend some more money in your kitchen. Marble is costly yet it creates an amazing look in the kitchen. It also adds the natural good quality effect of marble stone to your space. At a price, you can make your kitchen one of a kind with marble stone. Slate tiles help you to add more natural beauty to your kitchen. Leave the tiles un-grouted and use them for your splashback to mimic an exposed brick wall. The look you will create is not only naturally beautiful, exciting and inviting, but also rustic. What’s more, you can play with dark, grey or rich rustic colours for the best kitchen wall tiles design effect. These kitchen tile ideas 2019, you have an inspiration to make your kitchen one of a kind. Add a professional touch to your kitchen with J&A Tilling, an expert that offers exceptional tiling services in Essex and London.